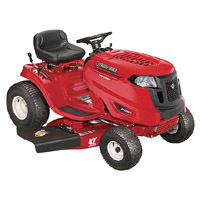 The Troy-Bilt Pony riding lawn mower is ideal for small to medium sized lots and yards. The “Pony” in the name gives most of it away. It’s a smaller mower, but still offers a punch when it comes down to it. It lacks the horsepower of some of the larger mowers on the list, but it can still get up to speed with the best of them. The turning radius is 18 inches. Not the best, but that shouldn’t be a real problem on a smaller yard. It’s also got a cupholder like many of the other riding mowers on the list. The feature isn’t necessary but comes in handy more than one might think. Headlights are another feature that may seem tacked on, but it’s nice to know The smaller size of this one is a benefit if storage space is limited. It comes at a reasonable price too. $999.99 for a solid mower like this is a deal.